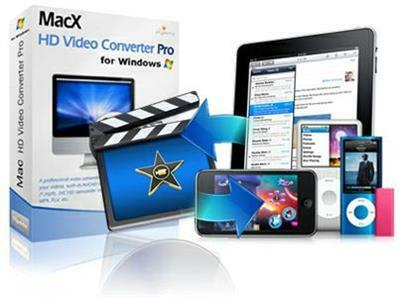 MacX HD Video Converter Pro for Windows - Convert among HD & SD Video and Convert Video to iPhone/iPad/PS3/Xbox/Android etc. MacX HD Video Converter Pro for Windows, combined with HD video converter, DVD burner and Youtube online video downloader, it does support a wealth of HD & SD video formats, including MKV, M2TS, MTS, AVCHD, AVI, MPEG, MP4, WMV, MOV, FLV, RM, RMVB, WebM, Google TV, and many more. In addition, you can select a specific output for your Apple device i.e. iPhone/5/4S, iPod, iPad/iPad 2/iPad 3/iPad Mini as well as Windows Media Player, PSP, PS3, Xbox, Zune, Android, Blackberry etc. On top of that, the unique feature of this video converter allows you burn video to DVD which is a worth unexpected bonus for users. The website online downloading function lets you freely enjoy downloading video from video sharing websites like YouTube, Metacafe, Dailymotion etc. A versatile converter accepts all common formats including both HD & SD video formats. This video converter's comprehensive list of supported input files including MOD, TOD, MTS/M2TS which are captured by JVC, Panasonic, Cannon, Sony camcorders, M2TS and VOB files from Blu-ray discs and standard DVDs the popular MKV files,as well as AVI, WMV, MPEG, MP4. FLV, H.264/MPEG-4, DivX, Xvid, MOV, RM, RMVB, VOB, ASF, 3GP, 3G2, QT, DAT, Google TV, WebM, VPX 8 files and more. You can select a specific output for your portable devices without questioning screen dimensions. Simply select your appropriated Apple device, i.e. iPhone/5/4S, iPod Touch, iPad/iPad 2/New iPad/iPad Mini and the software will configure your video for you. This program also has specific output selections for PSP, PS3, Zune, Xbox, Android, Microsoft Surface, and Blackberry etc. MacX HD Video Converter Pro for Windows can also download online video files from YouTube, Metacafe, Dailymotion etc directly from the URL link and in one step with converting them to specifying format you want. As a versatile video converter software, MacX HD Video Converter Pro for Windows had “DVD buring” feature in the side-by-side comparison among congeners. You can either backup popular movies to discs or burn DVDs out of footages you've taken by camcorders for sharing with your friends. As for some special video files, they can include several audio tracks and video tracks which are separated from each other, namely the multi-track video files, No matter what multi-track HD video converter you are looking for, M2TS converter, MKV converter, AVCHD converter, HDTV BDAV converter etc, MacX HD Video Converter Pro for Windows is your first choice. Unlike most of the products with traditional designed interface, MacX HD Video Converter Pro is not presented as a drop down list of file formats. Rather it is a selection of button located on the main screen. This makes your choices very easy without knowing exactly which file format your portable player uses. It will even extract audio tracks from video files and save them as MP3 files, which is handy if you like to create cell phone ring tones out of famous movie lines or TV sitcom theme songs. You are also allowed to take snapshot for your desired movie scene in JPEG or BMP as your computer wallpaper. Enjoy flawlessly smooth video playback on your PC, enhanced with embedded High Quality Engine, De-interlacing Engine, and Intelligent A/V Synchronizer. Now you can watch stunning entertainment from your PC. You are even allowed to customize all encoding setting like resolution, frame rate, bit rate, sample rate etc to satisfy your personal needs.